When it comes to naming the best classical movies ever released, then no doubt Neerja is on top of the list. Hailed as one of the most entertaining and having created the best suspense scenes and thrill while having the best visual effects, every person viewing the movie will be glued to the screens for the entire 122 minutes it runs. However, with it already running for a couple for weeks on the big screen, everyone can now enjoy it on their screens as it is coming to Star Plus live.The film which will be aired on Indian TV Live and is in Hindi revolves around an Airhostess by the name Neerja Bhanot. Directed by India’s very own Ram Madhvan and produced by one of the finest directors Shant Sivaram Man in collaboration with Atul Kasbekar of the biing and fox star studios, the film has had a huge success in box office bringing in more than 7 times its original expense. Starting as a normal flight, flight Pan Am flight 73 is then hijacked by a number of passengers, leaving all lives in the arms of a young hostess who sees it as her responsibility to keep all 395 passengers safe. With many plot twists and the dangerous hijackers to content with while keeping the passengers safe, Neerja is sure a must watch. Neerja Bhanot, the daughter of India takes the bullet and ends up saving many lives, proving she is just more than a flight attendant. A national Hero who fights to see no harm comes to the ones she calls her own. 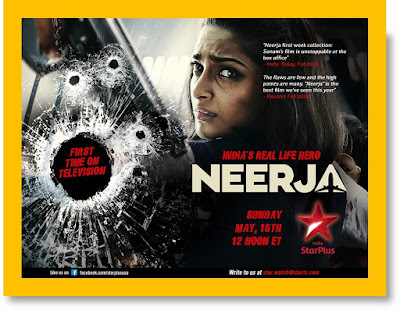 With a lot to entertain and teach, all who have missed the opportunity to see the movie now can see it with, as the world premiere of Neerja on Star Plus Live in US this Sunday May 15 is finally happening. Still guaranteed to move everyone with a range of emotions, all those who seek to see it again can get it straight at the comfort of their homes with Indian TV Live.